Paper Wasps are the most docile of the three main social species. They tend to only become problems when they build their umbrella shaped nests directly over doorways or other areas (such as under a picnic table) where close human interaction cannot be easily avoided. The nests, in which the egg cells open down, usually range in size from 15 to 50 cells. These wasps are long legged, elongated, and slender waisted. To the casual observer, they may appear to be black but are most likely golden brown, or darker, with large red or yellow patches. As they are not usually aggressive and are beneficial, (helping to control fruit destroying insects and flies) eliminating the nests is usually not necessary. 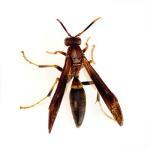 Read more about wasp removal.